After a period of relative stability, Melbourne’s median land price has dropped to $345,200. The City of Hume remains the most expense land market with a median of $378,000 (med. 448 sqm., ~$845 p.s.m.). Median lot size sits just above 400 sqm. Sales rates have fallen, down ~30%, YoY; resale lots on Gumtree, and other social media such as Facebook on the rise. Sound fundamentals, Victoria is projected to experience the largest and fastest increase in population over the projection period (between 60% to 130%). Recently a set of population data was released by the Australian Bureau of Statistics (ABS). The projections are not predictions or forecasts, but are simply illustrations of the growth and change in population which would occur if certain assumptions about future levels of fertility, mortality, overseas migration and internal migration were to prevail over the projection period. The assumptions are formulated on the basis of demographic trends seen in past data (Series A, B and C)1. Although the ranges are broad, Australia’s estimated resident population at 30 June 2017 of 24.6 million people is projected to increase to between 37.4 and 49.2 million people by 2066, yes, that’s right, 2066!!!!! At the top end, Series A equates to growth of close to half a million people per annum, while Series C equates to growth of around 250,000 persons per annum. Net overseas migration, a key demand driver for shelter, ranges from 175,000 to 275,000 persons per annum under the differing series. Australia is currently growing by around 380,000 persons per annum (QI. ’18). Of note, India has been Australia’s biggest source of skilled and family migrants in the last few years; it has also emerged as the top source of citizenship by conferral in Australia in the last five years. Closing off on net overseas migration (NOM), the level currently sits at the top end of the forecast band, around 240,000 nationally. In Victoria, it is around 90,000 persons (close to 35 per cent of the national NOM). The Government’s 2016 VIF publication forecast population growth of around 106,000 per annum. It assumed NOM would largely remain between 60,000 and 65,000 per annum over the period to 2030! It has been well documented, Victoria is projected to experience the largest and fastest increase in population over the projection period to 2066, increasing by between 60 per cent to 130 per cent. Over the short and more realistic timeframe, Victoria’s population is projected to reach between 7.5 million and 7.9 million people by 2027, which isn’t that far away now. The current population is around 6.4 million. This rate of growth flagged, projects annual growth of between 110,000 and 150,000 persons per annum. Over the last 12 months to March 2018, Victoria’s population growth has tempered to around 137,500 (albeit a healthy growth rate of 2.2 per cent over the 12 months). Our closest northern neighbour, Sydney, experienced growth of around 113,000 persons. Australia over the same timeframe grew by around 380,000 persons, a rate of 1.6 per cent. Victoria comprises around 26 per cent of the country’s population. 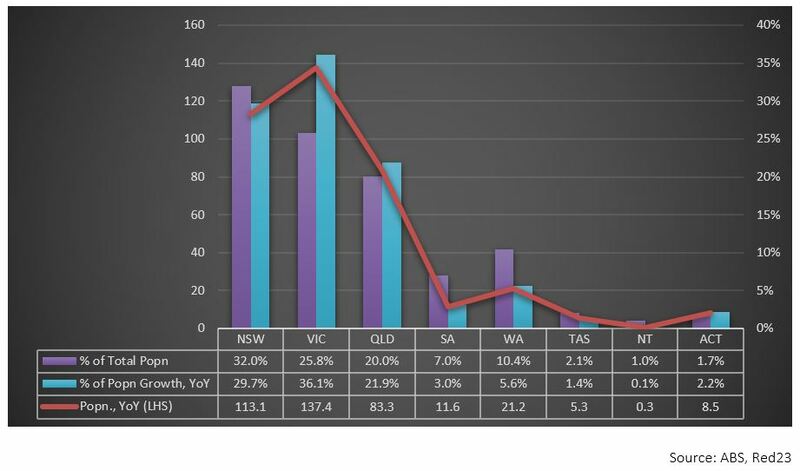 New South Wales and Queensland total 32 and 20 per cent respectively. But the gap is closing, Victoria has been growing faster than the national average and most other States. It has been increasing its share of population, up from around 25 per cent of total growth. At present, it totals around 35 per cent of national growth (~380,000p). New South Wales and Queensland comprise around 30 and 22 per cent of growth over the 12 months to March 2018 respectively. Now, to the growth area land market. Melbourne’s growth regions have experienced their second biggest fall in median land price since it hit its exhaustive peak in April this year at $355,000 (YoY growth of close to 40 per cent). This month saw a 1.1 per cent month-on-month decline, and a 15.5 per cent year-on-year increase as it now stands. Hume remains the highest performing municipality as it has done so for two successive months now, at an all-time high of $378,000. The gap between the most expensive and most affordable land market is around $100,000 – that is between Hume and Mitchell. 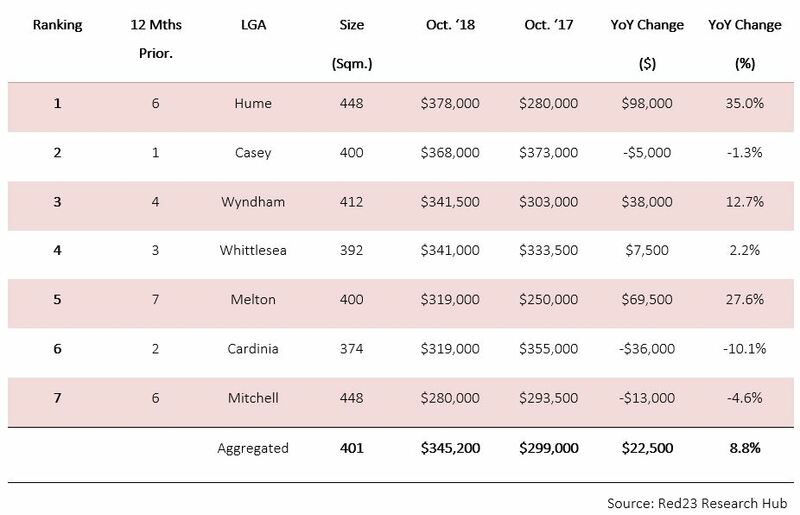 In terms of price growth, Wyndham and Hume were the only two regions to show any sign of positive market performance as they both displayed small yet encouraging increases in median land price in the month of October. Remembering, these are gross prices and do not include rebates and the like that are entering the domain – the maybe may be greater in some municipalities. Perhaps, in part the following table affords some insight into declining land prices. It shows the median prices of lots released and lots sold in October. More affordable product is entering the market. The median price of lots released during the month is some 5 per cent below that of lots sold ($319,00 versus $336,000). 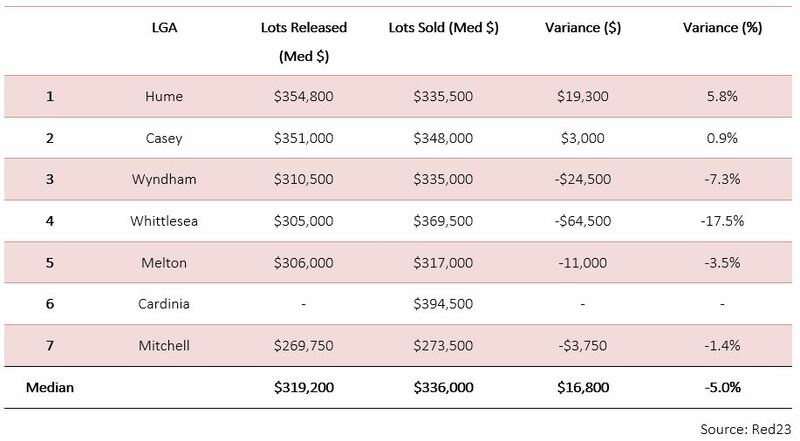 The most significant differential is in Whittlesea with a median lot price of lots released some $65,000 less than lots sold in the same month. An excellent chart was recently prepared by the Reserve Bank of Australia showing growth area sales volumes in Melbourne, and in comparison to other capital city markets (see – https://www.linkedin.com/in/andrew-perkins-30b6b512/). That said, volumes are significantly down, as is enquiry. Post State election, November and December numbers will be of interest. You will be hard pressed to find a single area within Melbourne’s growth regions that isn’t showing signs of sales pull-back – perhaps Berwick. Cardinia, Mitchell and Whittlesea are the lightest in relation to sales volumes. The only numbers on the rise appear to be that number of lots on Gumtree, ‘Indians in Tarneit’, ‘Indians in Melbourne’ and comparable social media. 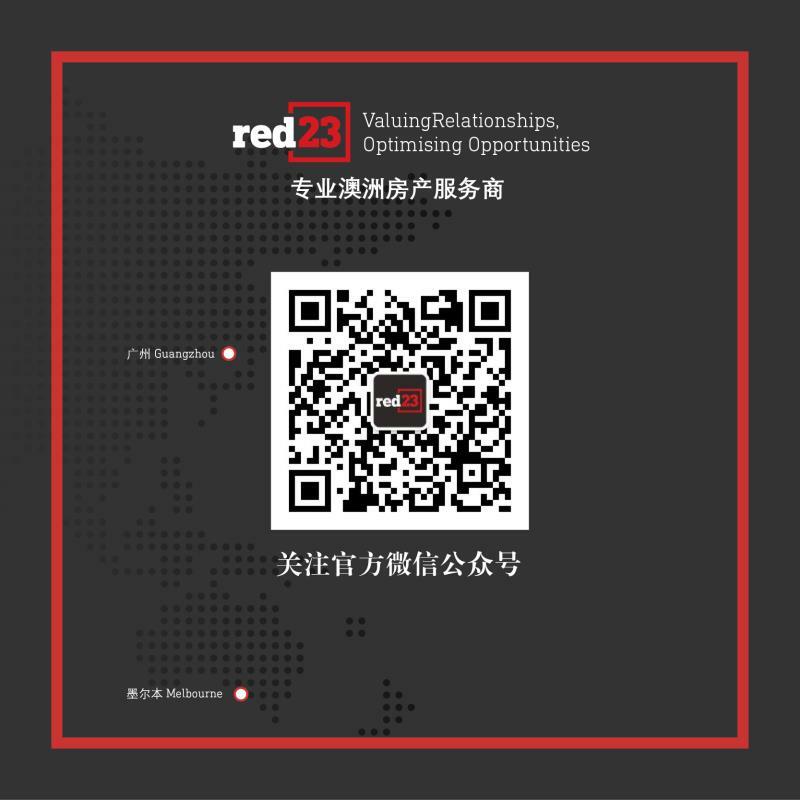 Analysis by a third-party supplied to Red23 indicates that there were around 450 growth area lots on Gumtree as at the end of October (of note, there were around 200 lots uploaded in under two weeks from the 1st of November, more than twice the number uploaded in September). Hume and Wyndham dominate – Cardinia the least. The dollar per square metre is also declining, as you would expect. Six out of seven municipalities had a month-on-month reduction in dollar per square meter after analysing October’s figures. Wyndham was the only area to show a positive result with its month-on-month dollar per square metre figures having grown by 4.4 per cent. For those interested, Greater Geelong has shown more signs of improvement having increased its median land price to $266,000.